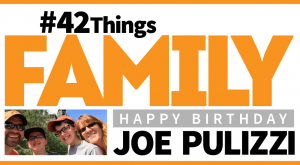 Happy Birthday Joe Pulizzi! Here are #42 things we wanted to say. Sunday, May 10 is Mother’s Day, and it’s also the birthday of our leader, our orange-clad compadre, our friend, our mentor, and our buddy. 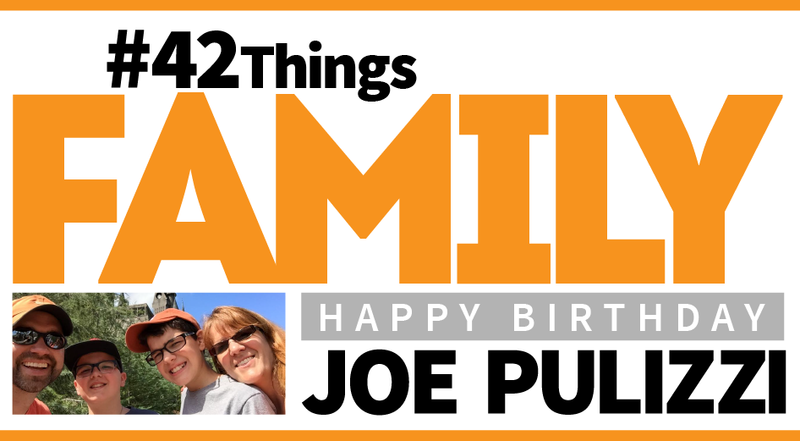 And not only is it Joe Pulizzi’s birthday, it’s also his 42nd birthday. Those that know Joe know that the number 42 holds a special place in his heart. 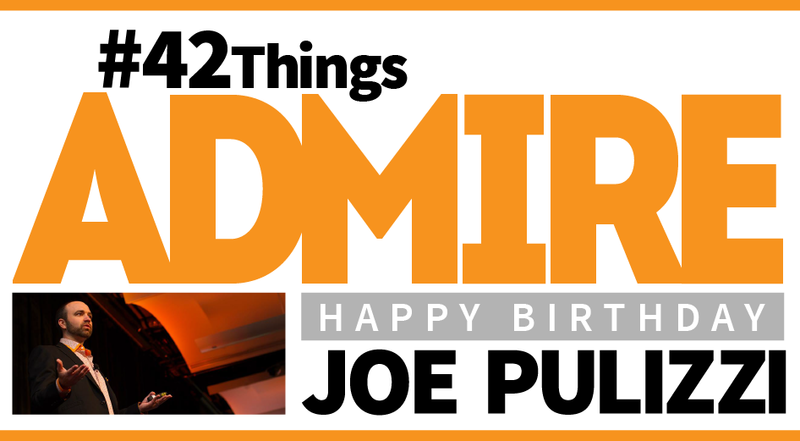 To celebrate, we compiled a list of #42things we love about Joe (though admittedly, you’ll notice some common themes). Enjoy! I love that he is so supportive and passionate about Cleveland – determined to keep the event here and hire locals whenever he can. It’s the first time I’ve ever been able to say I’m proud of the company that I work for. I love that Joe set out to do something he wanted to do. That it’s a great success on many levels. Joe doesn’t just see the big picture – he creates it. Yet, he’s someone who recognizes that a lot of details are required to make it happen and truly appreciates all the people who help make it possible. He is a genuine leader whose ability to inspire others goes far. Very early in my CMI days, I asked Joe a question and he said “Why are you asking me? That’s all you.” He lets us run with our ideas and own our projects. But most importantly, he is a passionate leader, a kind soul, and is there whenever we need something. Or whenever he finds an opportunity to laugh with (or at) us. I love Joe’s ability to surround himself with a team of talented, passionate people and inspire them to help change the world. Joe has a great laugh. It’s sort of musical and loud … and sometimes he laughs hard at moments you wouldn’t otherwise think are funny. It immediately sets you at ease and makes even mundane meetings entertaining and funny. 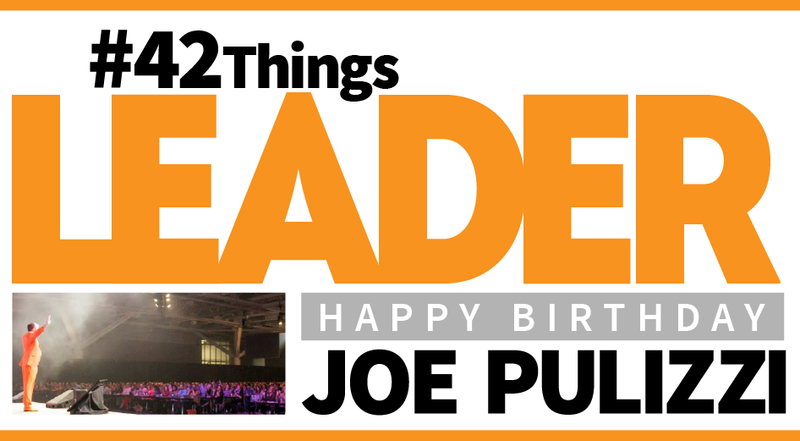 My thoughts on our 42 year old “Shining Star” leader: Gotta love Joe’s contagious, positive, rockin’ energy! Two Thumbs Up! Inspiring! One thing I think is great about JP is that I first met him at a Panera. Very “down to earth,” but very much down to business! One thing that I truly admire about Joe Pulizzi is his willingness to take risks. CMI wouldn’t be here, or be where we are if he didn’t take risks. When I came aboard years ago, he convinced me to leave my regular “safe” gig and take a chance on his new company (CMI). I took the leap and my life has never been the same… It was one of the best decisions I ever made. Happy birthday to the captain of this ship, my dear friend, and my brother. The very best to you Joe, you certainly deserve it. I love the sound of his laugh. Actually, it’s more of a snicker. It’s hard to describe but it’s somewhere between a looney character and a mischievous teenage boy…it just cracks me up. Hearing Joe laugh changes the tone of the day…in a good way of course! I have two things I love about Joe. Joe’s generosity of self for his family, friends, industry colleagues and other people who need a helping hand is really something special. On a lighter note, have you heard Joe’s laugh when he has heard something REALLY funny? You can’t help but laugh yourself. I think the thing I love about Joe is the ability to stay humble and be a great father and family man while making a difference in this crazy world with his awesome passion for Content Marketing. Also wanting to do something for children with his new foundation ~ The Orange Effect!! Love it! P.S. I also love Joe (and Pam) for giving me the chance to be a part of this great company! Whether he is at a sporting event for his sons, or on the stage at Content Marketing World he is the same “down to earth” guy with a great sense of humor. Something I love about Joe is that it seems like he’s always looking for ways to help others. What I love about Joe is his love and belief in the team. I have never had a job in all my 20+ years of working where I felt so valued, so appreciated and also that I really had a say in the direction of the company. While JP is our leader in all respects, he never fails to treat us all like equals, asking us all for input and valuing that input. He gives us the opportunity to really shape our future in the way we want to. It’s very empowering and certainly doesn’t feel like I have to go to “work” each day. One of the many things I love about Joe is that he is kind. He and Pam are among the nicest and most generous people I know. I am truly blessed to have them in my life. It is a joy to work for and with people who are sincerely nice. I wake up every single day feeling thankful that I work for Joe (and CMI). He has created a company with a culture that allows me to work (and work hard) from home but also have the flexibility to be present when my family needs me. I love that he is a genuine, down-to-earth person and it truly shows through his communications, dedication to the CMI team, and the community. One thing I love about JP is that any time I’ve ever talked with him, he seems calm and attentive despite the million things that must be going on in his brain. How does he do that? Because of CMI and the structure we have, I am able to work hard and LOVE what I do while also being able to spend time with my family and be there for them whenever they need it. Joe doesn’t just talk flexibility and work-life balance — he really means it. And he lives it with his own life as well. Joe can laugh, say “totes” and “dude” then drop mad knowledge all in one breath. I admire that realness, that authenticity. He just radiates positive energy everywhere he goes. There are two things I admire most about Joe. The first is his unconditional willingness to always give back. He is always willing to help, share, listen, pray, support, or whatever the need of the moment is, and really no matter who the person is. The other thing I love is his passion. It is contagious, and drives everything I do at CMI. I love Joe’s willingness to take calculated risks and try new ideas. He understands that growing, whether as a company or a person, requires pushing outside one’s comfort zone and implementing new initiatives. He has a true entrepreneurial spirit that is inspiring. I met Joe in 2004 at the offices of American Business Media, where he was serving as the chairperson of the ABM Custom Media Committee (which we now call Content Marketing). Despite a small group who sometimes looked upon him with glazed eyes as he evangelized the “new” virtues of brands thinking like publishers, I was always blown away by his passion. I remember calling him a few weeks later and asking him a bevy of questions around the topic of branded content, and soon after we met for drinks in NYC and quickly became friends. We joked about working together down the road. Joe is one of the most loyal men I know — working together now is a thrill and I am honored to call him my boss, and my friend. One of the MANY things I love about Joe is his innate ability to think of others before he thinks about himself. He’s one of the most generous people that I’ve ever met. Full respect to the only man I know that can pull of a full suit of orange…and look good doing it. In just my very short time with the team, I already feel fortunate to be able to work for someone as generous, sincere and thoughtful. Joe Pulizzi created an industry out of thin air, and that’s impressive. But for me the most notable thing about Joe is that he is trustworthy – in the literal sense of that word. He is worthy of trust. He is worthy of my trust, and he is worthy of the trust of the industry. Happy Birthday wishes to a man who does it all, but more importantly, does it all the right way. It’s hard not to admire a guy who rocks orange better than a pumpkin patch, is as kind-hearted and generous as the day is long, and is more entrepreneurial than anyone from A(ndrew Carnegie) to Z(uckerberg, Mark). The Press Club is lucky to have him on its Board, CLE is lucky to have him in its city, and the world of information is lucky to have him as its content guru. Joe, I admire your unwavering ability to set goals and achieve them. I applaud your uncanny ability to attract the most wonderful talent. I respect your opinion and value your advice. I commend your willingness to give back to the community at-large. But above all I value your friendship, your support, your ideas, your ambition, and your trust. You’re an inspiration to more than you know. Happy 42! What has always struck me as exceptional about Joe is the scope & scale of his entrepreneurial vision. He has built – rapidly – a massive business & reputation that positions him squarely among the great leaders in our industry. 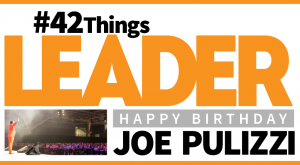 I am sure others may have recognized the potential of content marketing & thought it may be a discipline that could be trained, but I am equally certain that no one but Joe could have envisioned the breathtaking pace at which he would impact the bedrock principles of our craft…and on a global scale. It’s astounding. Joe is a true visionary. Joe is the best marketer I’ve ever met. I’m in awe of his tireless passion! 2. His friendly smile & warm persona. He’s so darn likable. 3. His unassuming way that sometimes masks a razor-sharp business sensibility. 4. His love for his wife & the boys. Obviously family comes first, above anything else. 5. The way he articulates complex ideas in a way that makes them seem not just doable… but also exciting and motivating to others. 6. His leadership in an industry that wasn’t always accepting of his ideas. It’s easy to forget that “content marketing” wasn’t always such a big deal. 7. The way he motivates me (and others) to consistently over-deliver. As in this list, right here. I said I’d give you four — and here’s 7. See what I mean? From the time I met Joe, many years ago, I was immediately taken with him. As I got to know him better, I was more impressed and quite sure he would become very successful in life. Joe is sincere, kind, trustworthy, dependable and intelligent. I have watched from the sidelines as he continues to succeed. Very impressive in his business commitments. But, most of all, I am impressed with the personal life he has created for himself. He has a wonderful family who love him and depend on him. Life is not always easy and sometimes you get surprises, but I think I look at Joe as the person who gets lemons and decides to make lemonade. I am very proud of you Joe and I have been very blessed to have been part of your life. The first time I met Joe Pulizzi in person was in Sydney, Australia. We’d spoken several times by phone and Skype and had traded email for a couple years by then. I was excited to finally meet him. When I extended my arm to shake his hand, he looked and me and said, “Come on!” then gave me a huge hug. Every time I see him, he does pretty much the same thing. When you work in one of the most remote cities on earth (Perth), it’s a nice reminder there’s a wider content marketing community that’s always ready to pull you in. It’s one of the things I admire most about Joe and CMI, fostering a culture of inclusiveness and support you rarely see in business. It’s a simple thing to do but creates a terrific environment for productivity and education. I worked with Joe, long before he launched the “Orange Movement,” and I always admired Joe’s passion, confidence, intelligence and most of all, the fact that he is simply, a wonderful person! Happy birthday Joe! I heard about Joe, before I actually met Joe. He was creating quite the stir with his concept of content marketing. When I met Joe and began to talk about intelligent content, I realized how very focused he was on not just communicating concepts but building a community, a practice, best practices, and the future of ‘content’ marketing. I liked the synergy, the drive, and the vision to change the way we do content. May you find your answer to life, the universe and everything! No, it’s not orange. Nor his love for orange. No, it’s not his infectious smile. Not even his adorable shyness. And certainly not his awful orange shoes (oops!). It’s all about how he answers emails. He wants to be nice to everybody, a great quality of a great, though aging man (oops again!). His emails are short and succinct, thus Joe is able to be everything to everyone every single day, save Saturdays. A great role model. 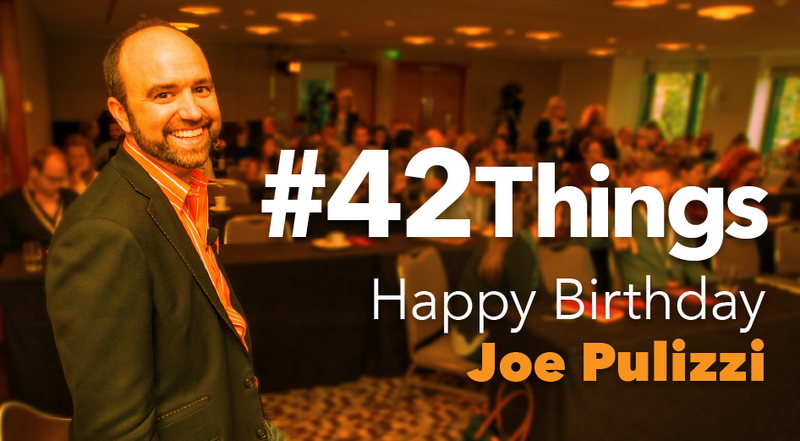 Thank you and happy birthday, Mr. P.
One thing I admire deeply about Joe Pulizzi is the fact that, despite his success, he makes everyone he talks to feel important and never puts himself above another. The first time I met Joe was at the first Content Marketing World. He didn’t really know me, but yet when I spoke and conversed with him he made me feel important. I could tell he cared. And I could tell he respected me as his equal. This is something I’ve never forgotten, and I also think it’s one of the reasons he’s so loved within this industry. It is hard to limit my experiences with him to a sentence or two. Thinking about our times together almost brings me to tears. His qualities range from sensitive to bold. But always knows family is his number one. I saw it coming many many years ago I must confess. You quickly realize this is no average Joe. Our time together has always been as best buds. When we do get together, it’s like we saw each other yesterday. I don’t only respect Joe Pulizzi, I love him. He is brilliant, successful, articulate, and charming. Most important, though, he demonstrates an interest and warmth in all of his encounters. His sincere interest in people, good soul and warmth get better with age. I am glad he is so young and we oldsters have so many more years to enjoy his friendship. What I admire about Joe: When most people work on a major presentation, they lock themselves in a room, shut off the electronics and go at it. They need quiet to concentrate. Not Joe. He sits cross-legged on the couch. The TV is on. The boys are on the floor playing games. A few adults split their time between talking and watching the TV. Joe is taking it all in while typing away on his laptop; the boys are boisterous; adults talking; TV blaring. Joe knocks out dazzling 40 minute slide presentation he has to deliver in a few days. Amazing! I love my Dad because he teaches me life lessons, helps me out, and is a strong supporting role in my life. I can always go talk to my Dad about anything. Happy 42nd birthday Dad! Thank you for rocking at your job! You could say my Dad is a great guy, but if you were me you would say he was a perfect father. He puts up with my antics, and is always willing to play a little ball with his favorite son. *wink* I couldn’t dream of a better father…and friend. Happy 42, Joe! Here’s to 42 (and then some) more years of changing the world. We’re glad to be with you on the journey. Do you have a birthday wish or message to add? Please leave a note for Joe in the comments! 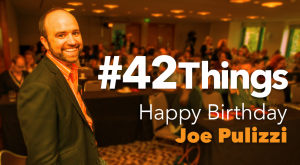 Or if you want to share on social, use hashtag #42things so we can make sure Joe sees it! Thanks! Joe, I’m proud to know you. You inspire me and so many through your ambition, charm, intellect and “get stuff done” approach to everything you do. Hope you had a great birthday! Thanks for contributing, Bernie! We agree on all counts! 🙂 Hope you had a great weekend! Love you man. Thanks for all the support throughout the years.